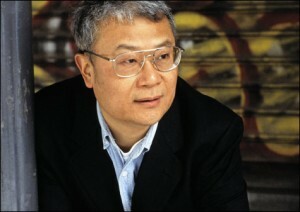 Not much is said at this moment about the Sino-American writer Ha Jin, in my view a major writer; his book ” War Trash ” is one of the most remarkable novels I’ve read in recent years. Good news, his latest novel, “A Free Life”, his first text on Chinese migrants in the United States, will be translated from English by Editions du Seuil In Paris, next september; we’ll come back on this. His recent collection of short stories (1) was less popular in the U.S. than his novels, yet some texts are of high quality. When he came across the neighborhood of Flushing, in the suburbs of New York in 2005, Ha Jin observed that the density of Chinese migrants, of various conditions, was such that English was not necessary. Twenty visits will follow to absorb the atmosphere, to be confortable with various details but without conducting interviews. The portraits are not idealized, even if one feels the author’s compassion for some of his characters. They are more often exploited by their community than by the surrounding Americans, this is the case of the monk, Kung Fu teacher, or of the prostitutes in the penultimate story of the collection. All this in a style somewhat detached, not seeking emotion, with often dialogues that seem rather plain and full of sentences and proverbs translated from the Chinese; this is the only handicap he acknowledges with the fact of not having English as mother tongue. What more to say; the writer justify his choices for his short stories and develops his remarks in an essay, “The Writer as Migrant” (2); an interesting book, a little too academic; the author sometimes hides behind an older generation: Conrad, Nabokov … and does not mention often his own feelings. But he confirms that he no longer wants to write about contemporary China, although these topics were successful (p.28); he has no ambition to be a spokesman, he just wants to be a writer. “Literature has no role in social change” and if the writer is committed to a cause, it must be a choice that is not imposed by society. 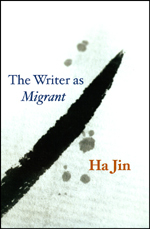 Language is the essential companion and that is why, for a migrant writer ” the major treason” is, like with Ha Jin, to choose to write in a language which is not not his own. But for his characters, the language is more prosaically an economic asset: for a migrant, speaking English brings more autonomy: the teacher, visiting the United States, fleeing the Chinese consulate and getting lost, can find work, even illegally because he speaks English. The woman linked to an Alzheimer patient, realizes that she can not ensure her future if she does not learn the language.Installed long ago, a teacher during tenure proceedings, may seek another kind of work because he speaks the language. But for the writer, the problem is not to loose his mother tongue “as it is in fact his country” (p. 78). He should use his mother tongue every day and this is why Ha Jin has even chosen to translate himself his book into Mandarin and to publish it in Taiwan. Also he should return to China to “recharge” the language; he does not do it because he is not published there. His characters are exiled from their memories and China. Immigration is a fresh start, often a new name and even for Gina (in “The Beauty”) a new face. They are also far from what they truly are; to find their place, they must struggle against themselves as well as against society. Older parents cannot handle. They vigorously deny the desire of their young grand children to change their name to fulfill their dream of becoming a young American. It’s all a bit too predictable, so is the conflict between a visiting mother and her daughter in law, but the solution found is unique: to get dismissed in order to convince the mother to return to China! Of course, money is important and addressed much more directly in China and in the United State than in France. A young woman manages to convince via internet her sister to lend her money to buy a car in China, the money she intended to use for an apartment in the U.S.
For others, a great concern for the future and the desire to save money: the home help who wants a retirement plan; co-tenants, each married on their side, who are saving for their partner still in China and who will share much more than an apartment ! The isolation and individualism of American society are sometimes difficult to handle, but social pressure is much lower than in China, even if the family in the home country, plays a big role. Some would prefer to cut completely with the past but this is impossible and “internet has ruined everything and my family is able to get hold of me whenever they like”! But no regrets for having left China apart for the grandparents who see their americanized grandchildren as their “enemy”! What is striking is the optimism for the future, the characters are certain they will find a way out; they have or will find the means to progress, which seemed impossible in China. 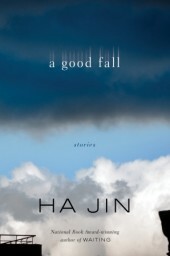 (1) “A Good Fall” Pantheon Books, 2009, 240 pages. (2) “The Writer as Migrant” The University of Chicago Press. 2007, 85 pages. Rao Pingru illustrates a love of sixty years. Romain Rolland, forgotten in France, praised in China.